By Gerald Andae. 19 March 2019. This story was originally posted in Daily Nation. The National Cereals and Produce Board (NCPB) has released 5,222 bags of maize to the drought-stricken counties as the government steps in to avert a humanitarian crisis. The stocks are part of the 3.5 million bags that the NCPB is currently holding as the Strategic Food Reserve. Managing Director Albin Sang said the maize that had been released is destined for Turkana, Baringo and Isiolo counties, which have been badly affected. “We’ve started releasing stocks from some of our depots as a measure of making the food is available to the drought-stricken regions,” he said. The National Drought Management Authority said close to 1.1 million people need food following poor performance of the October-November-December rains last year. The drought has prompted the government to release the strategic reserve stocks and make available Sh2 billion to help in distribution and tracking of water in the affected regions. Technocrats blamed poor distribution and a lack of funds for the ongoing hunger despite the country having enough food. Miltone Ayieko, Director at the Tegemeo Institute of Research and Policy, said distribution and affordability have become a major challenge in accessing food. “There is enough stocks in the country, but how does it get to vulnerable regions?” asked Dr. Ayieko. He said counties take the major share of the blame for failing to ensure that their people have food. “Agriculture is devolved and the county governments have to put a proper mechanism in place to ensure that devolved units produce sufficient food to avert hunger,” he said. The government announced on Tuesday that there are 46 million bags of maize currently in the country. The stocks are being held by agencies such as relief bodies, the NCPB, millers and farmers. 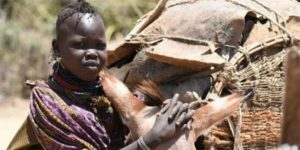 The Kenya Metrological Department on Monday warned that delayed March-April rains would worsen humanitarian situation in the already hit counties.